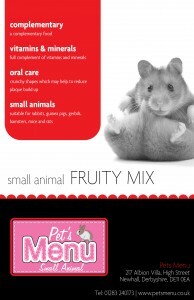 Healthy, nutritious treats, that are high in beneficial fiber and ideal for all small animals. They help promote emotional health and prevent boredom. All our treats contain the finest quality ingredients and can be fed daily as part of a balanced diet. Please ensure water is always available to your pet. The Pets Menu development of the Small animal treat range will also provide your treasured pet with a stimulating nutritious diet as well as the complimentary challenges that these treats are designed or. The small animal range provides everything a small animal may need, with nutritionally superior food that will keep them fit and healthy and intrigued whenever they are rewarded with our treats.